The studies regarding the publication of texts have had a long, abundant and bright production. Now, the history of publishing in Europe already has an established context enriched with new studies and it follows some very well defined and marked lines. The works of Chartier, Darton, Graffton or, in Spain, those of Martínez Martín have contributed to generate this European narrative about the ways of producing books, reaching to the public, sales, circulation of texts, reading spaces and the ability to socialize within these spaces. Issues such as the profile of the readers and/or the impact of the readings should also not be disregarded. Sometimes, in these comprehensive studies of the history of books, the value of translations has been neglected. It's obvious that without them, the circulation of these essential works, purveyors of knowledge, would not have been possible. On the other hand, the history of translation, with some important titles, has focused on the translator's invisibility and, at the same time, in the leading role of translators when it comes to establishing their working strategies. As Venuti has argued, fluidity, speed and the need to adapt to certain formats has ended up prevailing and thus giving a different form to the world than the one that the original texts intended – even masking the true sense of their messages. 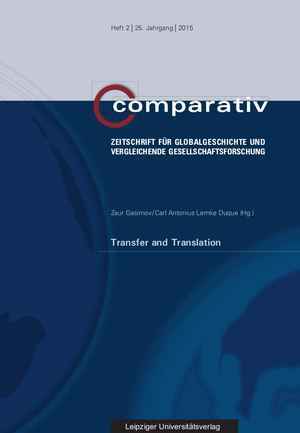 The key roles of this dossier for Comparativ, published by Zaur Gasimov and Carl Antonius Lamke Duque are not directly the translators that Venuti points at, but the discussion of the result and the context in which their translations were produced and the impact they had. The history of translation, as expressed very clearly by the editors, constitutes a sort of a third space in which, traditionally, the specialists in cultural transfers have wanted to observe, above all, the possibilities of bilingualism or the way in which an original in the source language became an original in the target language. However, the translation, from the perspective presented in this work, can be considered, as Leslie Sklair has pointed out, as a type of transnational practice. One example of such practices is the third symposium of the U4 network. It demonstrated how the answers to radical political transformations between the years 1750 and 1850 differed in various cultural contexts when using and translating the word "revolution". The role of translators was to connect the materials and texts that were produced by the political revolutions, relate them to the specific settings to which the translation was directed and to provide them with an understandable meaning. The translator and the translation, therefore, become interpreters of a concrete reality. In this context we have to frame this discussion. The aim of Carl Antonius Lemke Duque and Zaur Gasimov is to rethink the mechanisms by which intellectual works become pieces of cultural transference. Their guiding principle is that in the process of transmission, the translation serves for that transmission but also to "metabolize" the contents of the translated piece. The result enables readers, the learning public and researchers in general to be immersed in novelties, new concepts and new formulas. The three articles are concerned with the way meanings and contents change throughout the translation process or, as Lemke and Gasimov note, the "semantic turn", which is also present here. The editors and authors present the use of the LCMTC perspective rather than the traditional CMCT. It is necessary to briefly explain what these acronyms entail. The CMCT (Classical Model of Cultural Transfers) was born in 1990 via the French and German historiography with the participation of philologists. It established that cultural areas generally understood as nations, regions or any other type of historical entity could not be understood as something autonomous and hermetic but as dynamically interrelated systems. This theory allowed for borders to be blurred and for the focus to be placed on cultural transformations. Culture, therefore, was marked as a complex and reciprocal domain regarding its ability to transfer cultural structures. Here, the cultural intermediary assumed a special role, whether physical or material. The Logical Constitutive Model of Cultural Transfer (MCMCT) considers that every cultural artifact generates multiple discursive effects as part of a continuous and varied process of immediate reception in the new context which rapidly gives rise to new discursive meanings. So, the translation becomes almost simultaneous, a process of meaning production that is in itself a cultural transference. The original object immediately becomes a transferred and not a translated one. The transferred object contains the resignification, generates a discursive meaning and gives rise to a new cultural object completely adapted to the culture to which it was addressed. To the question for the fidelity and the non-betrayal of a translation the LCMCT has a clear answer: the translation generates a product more eclectic than faithful, a hybrid language, given that translations are not always direct from the source language but from many other languages that serve as second, or third vehicles. To support this meritorious theoretical position, Gasimov and Lemke, joined by Dina Gusejnova and Hasan Aksajkal, propose a journey through three concrete examples, three different ways of getting, reading and understanding the works of Kant, Keyserling and Lenin in three different cultural environments. Lemke's work focuses on the arrival of Kantian philosophy in Spain in the period of the first liberalism, the triennium between 1820 and 1823, a period of full reemergence of the ideals of the first Spanish Constitution, drawn up in Cádiz in 1812. Lemke analyzes the mentions and interpretations of Kant's readings that appeared in several Spanish newspapers. This leads him to another essential point of his study, the role of Toribio Núñez Sese, the lawyer who translated Kant into Spanish from the French version previously made by Charles Villiers. Lemke understands it as a fusion resulting from the different transferences and the impact, the work of Kant had in Castilian, once it made its way through France. Spanish liberalism, therefore, received Kant from liberals close to the European context that in many cases had known Kant in their exiles. Dina Gusejnova studies the dissemination of the book „Das Spektrum Europas“ by Hermann Keyserling and how the different translations in circulation of this text changed the effect on the readers depending on the translation that was used. Sometimes it served to raise the quality of the original text and to highlight some European cultures beyond the hegemonic ones, namely, France, Germany or Britain. As a result, a growing interest of intellectuals for Jewish culture emerged. Finally, the work written together by Zaur Gasimov and Hasan Aksaka studies the diffusion in Turkey of Lenin's book „Detskaia bolezn 'levizny v kommunizme“. The example they study is crucial for the understanding of the theoretical framework they apply and defend. From this work there were four different translations in Turkey since 1960, but none of them were made directly from Russian, but from English or French. The translators of the work included numerous notes clarifying in Turkish the text, which according to Gasimov and Aksakal, contributed to indigenize the Leninist text and, consequently, to bring the work of Lenin closer to the way the Turkish left looked at its own reality. The recommended report sheds light on a phenomenon that has not always been taken into account. It allows us to assess and verify the substantial changes that the translation, its preparation and reception can have on the original texts. All the articles that make up this report undoubtedly fulfill this purpose and, for that reason, the translators are sometimes not mentioned, nor are the publishers who commissioned the translations or the very circumstances of the translation process. This shortcoming that we are pointing out does not tarnish at all the excellent quality of the report, though it is one more element that, if added, would have elevated the quality that it already has. Roger Chartier, The Order of Books. Readers, Authors and Libraries in Europe Between the Fourteenth and Eighteenth Centuries, San Francisco 1994. Robert Darton, The Case for Books. Past, Present and Future. New York 2009. Anthony Grafton, Worlds Made by Words, Cambridge 2009. Jesús A. Martínez Martín, Historia de la edición en España. 1875–1936, Madrid 2001. Ders., Historia de la edición en España. 1939–1975, Madrid 2015. Lawrence Venuti, The Translator’s Invisibility. A History of Translation, London 2012. Leslie Sklair, Transnational Practices and the Analysis of the Global System. ESRC Transnational Communities Programme Working Paper 4 (1998). See U4 network “Reverberations of Revolution: Political Upheaval Seen from Afar” in Cooperation with the Early Career Research Group “Multiple Modernities”. 23.06.2016–25.06.2016. Göttingen. Bericht: Katrin Berndt, University of Bremen. Carolina Rodríguez López: Rezension zu: Gasimov, Zaur; Lemke Duque, Carl Antonius (Hrsg. ): Transfer and Translation. Leipzig 2015 , in: H-Soz-Kult, 22.10.2018, <www.hsozkult.de/publicationreview/id/rezbuecher-26209>.